My son had his track meet the other day. He loves to run and for the last few weeks, we’ve had to brave the early morning chill to go to the running club practices before school started. 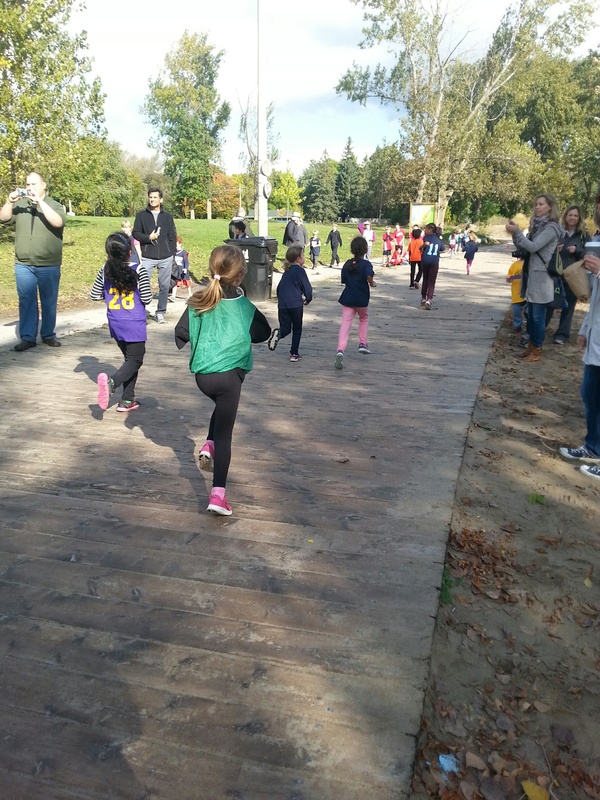 Grades 1-6 would practice in cold, rain and sunshine, learning the skills and timing required for the annual school area race. Parents, coffee mugs in hand, would huddle and yak while the kids did their laps and stretches. 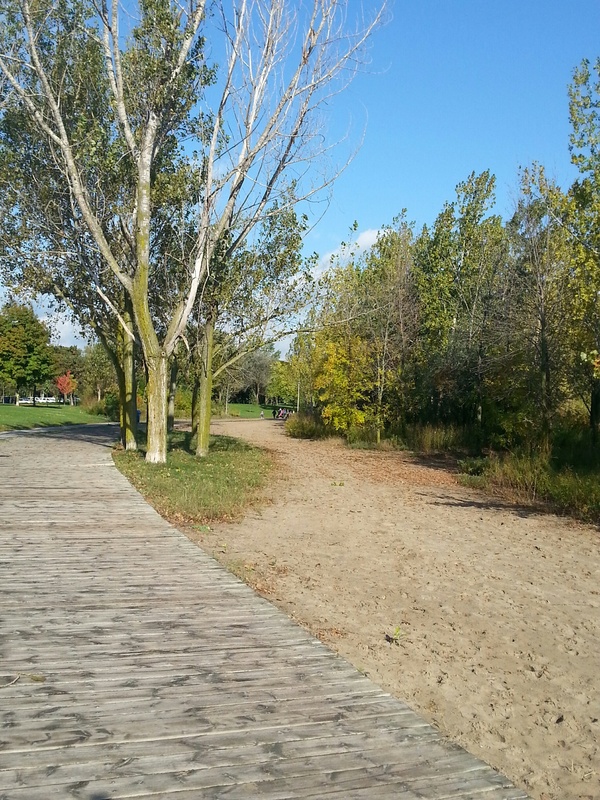 I took the youngest with me and I would play on my phone or just sit and watch the kids lapping around the track, rubber on cement, crackling through dry coloured leaves. 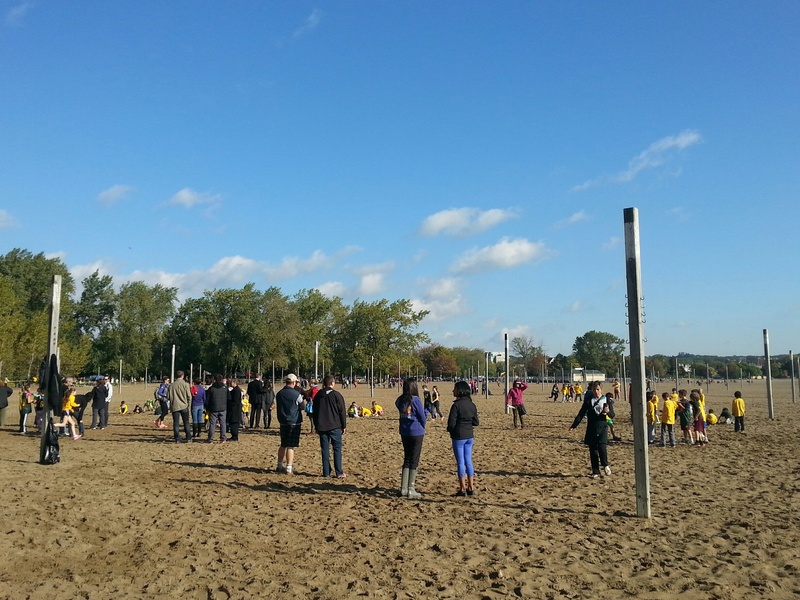 At the track meet, schools from all over descended upon one of our beaches. It’s a familiar place, as I tend to do a lot of my runs there. School bus after school bus poured in with children dressed up in different school colours, buzzing with excitement. The type of energy that if harnessed, could power a small town. And as the races loomed, I watched the adults get concerned with matters of importance (wrangling kids, getting schedules, etc) while the kids played. In our area, all the kids built sandcastles and tugged away on each other, almost oblivious that there were races to be had. And raced they did. Grade 1 girls, then grade 1 boys and so on. Our son raced his heart out, big smile on his face, enjoying it. I watched many of the races, always suppressing the the sudden need to tear up. Why I tear up at these things, I don’t know. I just do. Even the races where my son isn’t running. It think there is something about the innocence of it all, the running for the sheer joy of running, no looking at GPS watches, no worrying about place, no fussing over footwear and product placement. Even the last place children ran with gusto, with energy, with grins. And even when they walked, the crowd of parents and schoolmates cheered them on, exhibiting an honourable and sweet sportsmanship that seems to erode and dissipate as we get older…and more serious. The idea that these kids ran without attachment to outcome was refreshing to me. That they could move through the act of doing, rather than foreseeing and banking their emotional health on a net result was something I needed to see with my own eyes. And perhaps that is why my own eyes got wet watching them. Lost in the idea that I am moving through a journey with no intended result other than just the journey itself. And that is a big, heartbreaking, yet liberating shift for me. When I was active in my drinking, everything I did had a purpose and I had an outcome in mind – top dog. We are all familiar with the old “I won’t do it unless I am perfect at it” type mentality that many of us coveted and played out in many ways. I never would have been able to run like I do now because I would have set myself up for spectacular failure. Not only would I have had to win my first ever marathon, ignoring the fact that only elite of the elite actually win them, but I would have to decimate the field. Or, failing that, get my Boston Qualifier in at the very least (for the non-runners here, you need to qualify time-wise, to run the Boston Marathon – the most prestigious marathon in the world). The idea of “competing against myself” was as alien as it was to just have one or two beers. Preposterous. Relieving myself of any outcome is foreign territory to me, but I have made strides in it. I know because in my own running, I have let go of any sort of preconceived notions of what I “should” be doing and how I should be doing it. Or how fast I should be doing it. If I were in my own head of old, I would have stopped running a long time ago. The Superego would have told me I was worthless and useless and why bother when you can’t make it around the block without getting winded? Nothing short of perfection would not have been tolerated and I would have punished myself with some over-the-top beatings. Running now is an exercise both for body, mind and spirit. My mind gets to let go of those thoughts of where I am supposed to be not only in my pace, gait and breathing, but in this whole scheme of things. My running is a mirror to where I am at emotionally and mentally. When I am down and out, and practising self-pity, I notice that I scrutinize my own results or compare them to those much stronger than I. When I am in a more centered place, just the act of running alone is enough to keep me satisfied. While I have my Garmin GPS watch to give me the cold hard facts of my timing, it can’t detail how the running conditions are – is it raining, slippery, windy? Am I undernourished or had too much coffee? Am I just not feeling it that day? Same with things in my life, my recovery, my place on earth – I might have the cold hard fact of money, status and all those other things that are supposed barometers to my overall “success” but they don’t take into account my connection with Creator that day, or how I have been approaching my thinking, or how is my spiritual health in that moment? In the end, I have to go by feel, by instinct, by my conscious contact with a Higher Power to let me know where I really stand, not according to some scale or digital device strapped to my wrist. Of course I do have certain things I need to achieve when training for this marathon, but I don’t get hung up on the days when things don’t go according to plan. I trust the process. 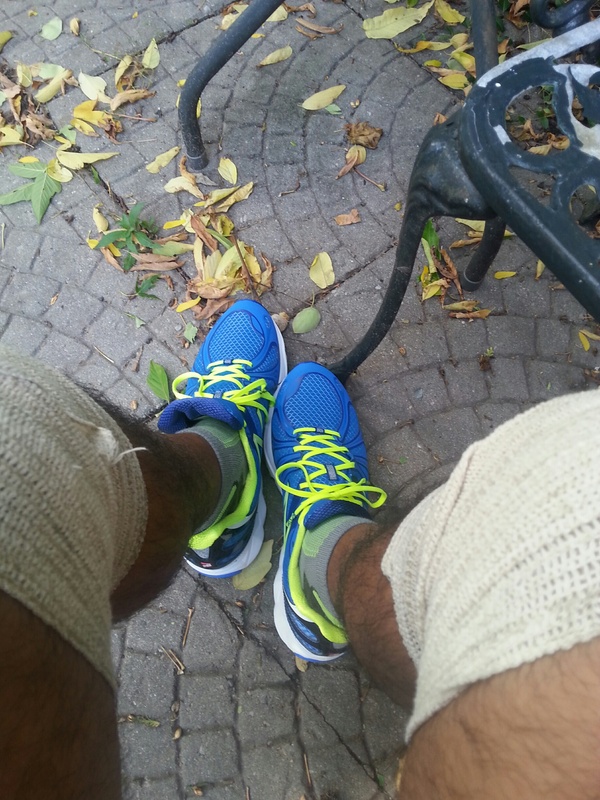 I have had to cut short long runs because of fatigue, or because my knees acted up or what not. I have also had incredible runs where I didn’t want to stop. I have endured sweltering days, storm-like winds, rain, ice, snow, etc. in my training. I have adapted and overcome. And sometimes succumbed. And that’s okay. One run or even two does not a season break. And I have to keep that in mind for myself too. I am not going to be perfect in any way, shape or form. Practice for me is just that – practice. It doesn’t make me perfect, but it does bring me to the idea that it’s the journey that matters, not the destination. In all my affairs. But here’s the kicker – when I let go of where I want to be, and focus on the now, I ease up on myself and actually get stronger in many ways. Letting go and surrendering brings me victory in many ways. Letting go of what my recovery should look like brings me better recovery. Letting go of what my running should look like brings me stronger running. Letting go of what my life in general should look like brings me brighter clarity. So in less than two weeks, when I run my first full marathon, I will keep this in mind. Whether I finish last or surpass my 4:45 or 5:00 hr expected finish, it won’t matter. Just doing it will. Being able to be a part of it, and getting out of my comfort zone is the deal. I will think of those kids on the boardwalk there, enjoying themselves, smiling for cameras, being in the moment…that’s what I want and hope for myself. I just have to get myself out of the way. Oh, I tear up at things like that too! My boys swim and I swear, just watching them pull and kick themselves across the pool makes me feel so protective and amazed. Running is such a great thing. I have learned to be where I am- I’m trying to learn it. I ran on the treadmill while the boys were at swim practice last night and I managed to run maybe half a mile and walk the rest. My brain can’t get over how much things have changed in just a relatively short time. I thought that when I got sober I would really improve my running and it would be amazing and great to not have to pound out the miles desperately hungover. Then I ran my last race (over a year ago) and got hurt. I got hurt because I wasn’t running regularly and I took on a 7.5 mile trail run. And then…..no running. How did I get hurt then and not when I was out running 22 miles in the blazing South Carolina heat I will never understand! 🙂 Then trying to run and still hurting and stopping. Then months later trying again. And hurting. I see those people out for a run- fuel belts on, running forever and I am so jealous. But the thing I love about running is that it’s mine. Whether it’s 1/2 a mile or 22 of them. All of it is really like trying to carry a cup of coffee. You have to pay attention, but not toooo much attention because then you’ll spill for sure. I have so enjoyed your last few posts! I meant to rave on the last one and but then I was reading it on my phone and then I couldn’t remember my wordpress login and lord. So belatedly THANK YOU. And right now THANK YOU. 🙂 Cheers! Love the coffee analogy, Amy – and love seeing you here as well! As for the running thing – like you said, it’s yours regardless of the distance and time. I started running for one minute, then walking one and a half minutes, then running one minute, etc. I couldn’t understand those with fuel belts either, etc. But I got there slowly. I try to use that same perspective in other things as well. And yeah, weird that you can run all that before and not get hurt then try again slowly and get hurt! Aggravating! I got hurt a while back and had to sit out 4-5 weeks. Frustrating! Looking at the kids squeezes my heart too. To be young and free from anxiety and worry. I admire runners. I am just not built for it. I’ve tried, back in the day when I believed in a lot of “shoulds”. My place today is in yoga. Wherever we find that ability to feel the freedom, it is a blessing. I often wonder if I am built for it too, to be honest. I know I am not build for speed, that’s clear. Some people are naturally gifted in certain areas – this ain’t one of mine. But I do it, and it’s fun (sorta…lol) and it doesn’t hurt that I lose weight either. picture me, sitting…wit, no standing! jumping! screaming! as you pull in at the finish line, no matter your time. TA-DA!! Paul did it! he ran a M-F marathon!! I don’t care about the time, he DID it! i’ve been thinking a lot about crossing all kinds of finish lines lately…and it’s never the time,it’s always the journey there. Your journey is awesome, and sharing it so freely is even better. So excited for you…keep us posted! I was just commenting on Josie’s post today about how when we start measuring things we can end up losing focus of what really matters … I like to track my runs with a gps app too, but then I find myself stressing about my pace, when I’m not training for or aiming at anything in particular! Ridiculous! For me, just putting on my trainers and actually going for a run is the big deal. Way back in another life when I was working, I used to get paid a bonus that was based on the work that we did, and I ended up getting so obsessed by how much this bonus was, and that *so* wasn’t the point of why I was doing the job. I am trying to catch myself at it now – getting all wrapped up in the numbers that might prove I’m good enough – when as you say, it is the journey, not the destination, that counts. I have spent enough of my life looking for proof of worth in the numbers… but I know now that’s it’s an unhappy search. So wonderful to hear about your older one running with a smile on her face. Oh to have those days! But I see that in adults too in some cases. I hope I remember to smile at the end of my race…I might be too knackered to do it…but I have been trying to be cognisant of it. What you say about getting the runners on – that’s important. Other than injury, I have never taken off the shoes after putting them on. So mentally, getting them on is key. After that, I just follow. And yeah, the GPS is great for some things, but I have learned to be a slave to it. Everyone had their off days, and efforts, etc. The Garmin doesn’t reflect that, so sometimes the effort is strong, but weak in the numbers…that’s fine. And vice-versa. So while it’s a guide more than anything, I don’t hold onto it for dear life. Great comments and great to see that you get out there and do your thing too! So excited for you, and I think your head is in the right space going into the marathon. I needed to be reminded of Many things you said, not just in regard to my running. I can’t wait to hear about your experience. I found it to be a life changer in many ways. Man I am in stitches right now just writing that story out, it was priceless! I so totally love this post, and I thank you for being the perpetual God moment in any day that you and I interact. PS… that “running for the joy of running thing” does have an expiration date on it, so you are wise to be soaking it in while you can. My son is in Cross Country, and these kids are pretty darn serious. I wish I had thought to get him involved at the younger age! Yeah, big picture stuff…love that too. Easy for you and I to say all that here and now in our spirits on the blogs…hard to do for me when I am caught up in the day-to-day stuff. But one thing that is happening to me Josie lately is that I am catching myself on a lot of things (another post soon, methinks). It’s like finally all that stuff I have been reading about or heard at meetings (Josie, don’t ask when I went to my last meeting, okay?? lol) finally soaking in. Also been reading a lot of Ekhart Tolle and I am starting to actually remember and use what he says. It’s life changing, all of it. And yeah, I am sure the competitive fire burns brighter as the kids mature. Some of the kids right now seem to have that look in them. One of the moms mentioned that you can tell the kids who are more into it because they are the ones gritting their teeth rather than smiling…lol. I still tear up at things like that and so does the hubs. I’m not sure why either but I do it every time. Pride? Innocence? Purity of spirit? Who knows? I just know it touches me and that’s all I need to know. You’re going to be perform great at your marathon specifically because you have that attiude. Win, lose or draw, it’s the experience, being present and soaking in the moment that matters. I’ll be there with you in spirit, cheering you on no matter what!!! That’s what friends do! Wonderful post. Perfectionism is one of the biggest problems I struggle with. Looking forward to hearing about your marathon! Oh yeah…I have discussed perfectionism a few times I think and it’s still something that crops up. It’s all steeped in ego, in the end. It tells me that it’s okay for YOU to mess up and be fine, but for me, it’s not okay. That’s because I am better than you, don’t you see? lol. That’s the background noise when perfectionism comes up. I have come to see it a lot quicker when it comes on, and do my best to steer away from it. You’re going to do great Paul. No matter what your finish time is, it will be a personal record. that means a lot coming from you, Christy! Yeah, no kidding – whatever it is, it’s a PR! That’s the best way of looking at it. Yep, I tear up too at just about all school performances. And I really liked the line about the journey being the point. It’s so easy to forget and get caught up, and this post reframed things in a soothing, helpful way. Thank you. Good luck on your marathon! Can’t wait to read about it, already picturing you taking in those sweet moments of connection with the crowd, the scenery and the act of running itself. How exciting. Thank Kristen. I am nervous, but a good nervous I suppose. That, or I am in denial. Might be a different story when I am closer to the day. I think it’s because my expectations are low that I am not too worried. If I were gunning for a specific time or something…perhaps a different story. Wonderful Paul. I’m touched by your soft spot and teary eyes. Even typing this out I have an emotional experience. The simple act of offering His best to the newborn king, Jesus. He wasn’t highly trained. He wasn’t super advanced as a drummer. He was just an innocent little boy that wanted to give something to Jesus. And He played his best for him. “Then He smiled at me” Oh my gosh. That’s what touches me most. So, my beautiful friend, perfection for me is doing my best for Him, with a full heart of love and devotion. No pretense. No showing off. Just simply offering my best. Wonderful post Paul, as always. And hey, thanks for thinking of me on your run! Hope it was a good one!! Thanks for the link Paul. I’ll have to check it out. The reward of the journey is- you get to cross all kinds of finish lines- that you never knew were there. Love it, Mike. Wise words. Everyone who has run one has said the same thing, Lucy…that it changes you in a way. I too have heard that .05-1% of the population has run a marathon. That’s a lot, and yet not a lot! Regardless of those stats, it’s something new for me and I am looking forward to it. 1) What you say “feels” the same as I did the day that I was allowed out of the hospital for the first time after months of cancer treatment. The world is such a wonderful place and we are so amazing, even with all our flaws. Our very existence is orders of magnitude greater than anything we could ever accomplish ourselves. We could just sit and look at the world and we would still be majorly successful. 2) I don’t really ever “let go” per se. What I do is transfer responsibility of the world from myself or others to God . It sort of feels like letting go (like the old saying: you have to let go to hold on) but it is allowing myself to be at peace with the world – God’s world. I don’t exactly name God in my thoughts as I am here – it feels more like accepting totality and my place in it – an important and unique place regardless of what I do or don’t do. The lesson you speak of Paul is a major one in any person’s life – it was in mine. It actually turns out that I am very good naturally at some things and not so good at others – and it really doesn’t matter much which is which. The big thing is that I get to contribute – an ability that has been given to me by grace. Not an ability of my making. There have been situations where I produced amazing results simply by knowing a few small things in an area where I was incompetent. And other times when I could not solve a problem exactly in my area of expertize because it was too complex. Either way, I contributed. Awesome post Paul. Thank you yet again for your insightfullness. Thank you again Paul for your insightful and poignant comments. I always look forward to them. 1) I am glad that things are better for you, health wise. I can’t imagine what that was like, but I can relate to seeing the world in a new light. Just this morning I was watching a beautiful sunrise, and thanked God for it. Hokey to some, but you know, it felt right to do so. I am not the Creator, and to stand in awe of His work is something I try to engage in more. And what you say about competency…I agree. I didn’t before. I had to be best in all…but that is setting up for failure and resentment. I do what I can, and sometimes it’s not what I expect, but I still do it. Thank you Paul…fantastic taking in your thoughts. wonderful post and comments. thank you both to you Paul and to the other wise owls too. You’ve eloquently described everything I love about running and did so in a manner that fills me with joy. I have my running clothes on this morning and was distressed that my knee won’t let me join my husband who is with my dog putting in carefree 10 miles right now. I was bummed to note that the Chicago Marathon is this weekend and that I’m soooo far away from the point I was when I made Chicago my first. I was wallowing in a bit of a pity party until I read your words and remembered the importance and the innocence of such a simple act. Thank you, Paul and best wishes on your race. I’ll be right beside you in spirit! Would you do another marathon? Or a half? Or any other race (5K, 10K?) I will see how I feel after this one. Might stick to some more 5K and 10K’s to see how it goes. Marathon training is tough, and frankly, I wasn’t really training as much as I was just running a lot. I didn’t do interval or track work, very little hill work, etc. If I decide to get a bit more serious, I might consider a coach (see how we are financially on that one). Anyway, one thing at a time! Thanks for the well wishes here and on Twitter. One week to go! I’m pretty sure a full marathon is out…just for the reason you mentioned. The training is tough and so time consuming. Halves are my favorite and I still want to break 2 hours (sitting at 2:02!). BUT, things haven’t been the same since I broke my foot a couple of years ago. I broke it in 3 places in the middle of a duathlon…and finished the stupid race anyway. Yup. I have issues. Anyhoo…I started running too soon after the break and I’m sure I compensated by using poor knee mechanics. I personally love your approach to this race. You are running to run…intervals and fartleks and tempo running tend to rob some of the joy. I’m hoping that you’re grabbing joy in this whole process!! Great post, I must say beautifully narrated. Yes, walking and running are such a refreshing feeling, in fact it is much more than the physical relaxation, it is magic to mind…once we are into the zone of walking or running in the heart of nature, ideas simply flow and thinking starts exploring uncharted territories.